We tend to think of May and September as the peak periods for warbler migration. Notes: At first it felt strange to declare the fall season underway on August 1, but over the past week we have found plenty of evidence that migration has indeed begun. While the greatest number of species seen on any day this week was 42, a total of 74 were seen, with many of them just passing through on one or two mornings. This is already more species than were seen in all of July! One of the most noticeable migrations this week was that of the Yellow Warblers, which peaked on Wednesday morning with roughly 30 in the area. Also noteworthy were the flocks of juvenile Baltimore Orioles, sometimes 6-8 of them sharing the same branch of a large tree. Though most were present in small numbers, it was equally impressive to have 13 species of warbler present on August 6. With the addition of three others the next morning, we ended up with 16 warbler species for the week, including MBO's first ever Bay-breasted. 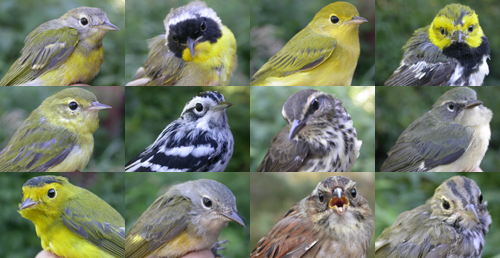 The banding season got off to a great start with 21 birds in a single hour on August 1. Subsequent efforts on August 3 and 6 produced somewhat more modest numbers, but all the same we're very happy to have already banded 69 birds in our first week, at a rate of nearly 100 birds per 100 net hours (double our spring average).